Bud is now 19 months and we’re having a great summer where his agility skills are coming together. There are so many exciting first times. I think I start most things a bit later than other people. 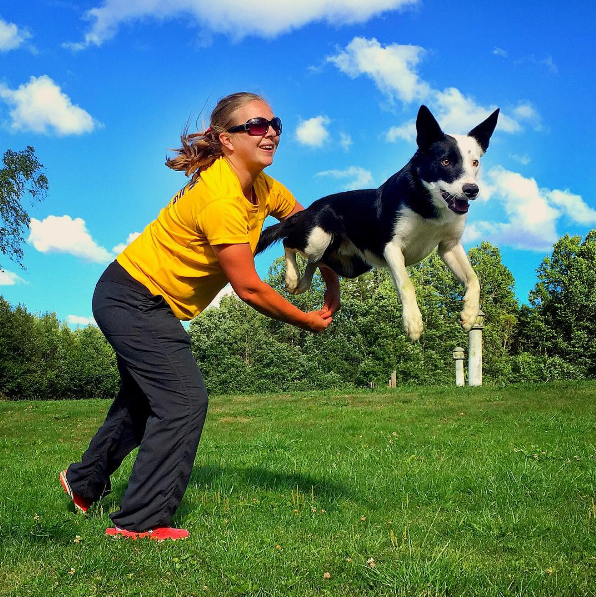 It’s easy to get stressed out by all the younger dogs running courses at full height when your young dog is still working on foundation skills. Bud has been very keen to work and easily excited all his life. But he has also been immature and easily excited also means easily frustrated if he doesn’t understand. I’ve had to teach each skill to fluency before putting skills together in a sequence. Lumping doesn’t work well with Bud. I’ve also been reminded of the importance of letting the dog direct the pace of training. If something is not working, it’s often a good idea to not push it, but rather work on other things for a while. There are so many things that just didn’t feel right – he didn’t like them, or he didn’t understand. So I waited for a while and when I came back to it a few weeks later he could just do it, and he wanted to do it. Bud has been jumping 40-45 centimeters for quite a long time. He did not seem ready for higher jumps and I was getting a bit stressed by it, but didn’t push it at all. Then last week, he jumped 55 centimeters on his own a few times (when just running around on the field at home). I tried to ask him to do it, and he did! And then he was able to run a fairly complex sequence with jumps on 55 without hesitation. He is still figuring out his jumping, but I’m very pleased with that he is thinking and trying his very best. I started his weave training a couple of months ago. We’re mostly using a channel method, with some 2×2 thrown in. Things were going well until I started to close the channel. He seemed frustrated and couldn’t really do it. I tried to use guide wires because I know a lot of people are successful with the combination of channel and wires. This was very entertaining to watch, but gave me more problems than I already had. So we just stopped weave training for a while instead. This week, we’ve started our weave training again. I started with a fairly open channel, reminding him of all kinds of entries and staying in the weaves with different handling and distractions. I’ve now started to close the channel again, and everything is different. He is much more happy, much more confident and his body seems to flow in a much better way. A third example is our running contacts training. We started about five weeks ago with a plank on the ground and he has been a joy to train. He really seems to get it and we’re having a lot of fun with proofing and teaching turns now. The only thing that has been difficult was to get rid of the thin and broad plank I used on the down ramp to smoothen the edge for him. My dogwalk has a pretty high edge at the end of the contact, and it gets more pronounced when the dogwalk is low. When I tried to take the plank away he’d have one nice hit and then it would fall apart and he’d avoid the low hits. So I didn’t take it away any more. I kept it there for a few more weeks, and then I tried to take it away again a few days ago. Now he didn’t have any problems and I think I can put the extra plank away and not take it out again until I’m training a new dog. I’m very happy that I’ve had the patience to wait until Bud has told me that he is ready. It doesn’t mean that we haven’t been training – we’ve just trained other things (and you can never get too much foundation training). I think that a lot of problems can be avoided if we’re not pushing dogs beyond their comfort zone and if we allow them to mature. Every dog has their own timeline. I love training with Bud and I’m very excited to see him transform from my little puppy to a skilled agility dog. I’m not in a hurry to compete with him and he still has a lot to learn. Here’s a video of to “firsts” from this weekend. His first sequence on large height jumps, and his first session on full height dogwalk with no plank. Kloka ord 🙂 Jag kan känna igen mig i det där att man prova en sak och det inte funkar, väntar och sen när man provar nästa gång så funkar det utan problem. Tror som du säger att då är hunden redo. Vidarr has also taught me this lesson. Things that seemed insurmountable when he was 1 year old are now no big deal. I am sad I paired so much of agility training with frustration. He still gets frustrated, but his tolerance is much better. I am so excited how things are progressing with Bud!